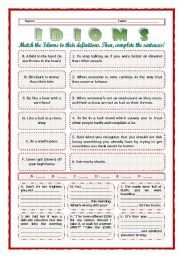 --*--*--*-- Idioms 01! --*-- Animals --*-- Definitions + Exercise --*-- BW Included --*--*--*-- FULLY EDITABLE WITH KEY! --*--*--*-- Idioms 07! --*-- Animals --*-- Definitions + Exercise --*-- BW Included --*--*--*-- FULLY EDITABLE WITH KEY! 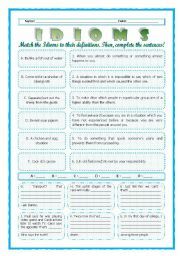 Simple exercise: students match the idioms to their definitions and then complete the sentences. The definitions and the sentences were taken from Cambridge Dictionary (online). Idioms: Let the cat out of the bag ~*~ Sick as a dog ~*~ Big fish ~*~ Fish or cut bait ~*~ Put/throw a spanner in the works ~*~ Be the nature of the beast. 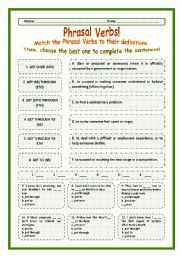 > Phrasal Verbs Practice 80! > --*-- Definitions + Exercise --*-- BW Included --*-- Fully Editable With Key! ~*~*~*~ Let’s Review! ~*~ Verb to Be ~*~ Definition + Exercises ~*~ Grayscale Included ~*~*~*~ FULLY EDITABLE WITH KEY! 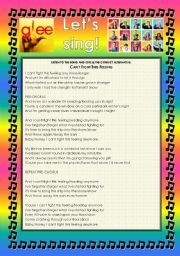 GLEE SERIES – SONGS FOR CLASS! S01E01 – FOUR SONGS – FULLY EDITABLE WITH KEY! 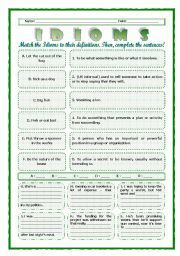 --*--*--*-- Idioms 02! --*-- Animals --*-- Definitions + Exercise --*-- BW Included --*--*--*-- FULLY EDITABLE WITH KEY! 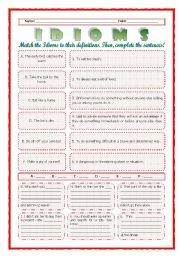 Simple exercise: students match the idioms to their definitions and then complete the sentences. The definitions and the sentences were taken from Cambridge Dictionary (online). Idioms: The early bird catches the worm ~*~ Take the bull by the horns ~*~ Eat like a horse ~*~ The lion’s den ~*~ Do sth off your own bat ~*~ Make a pig of yourself. --*--*--*-- Idioms 09! --*-- Animals --*-- Definitions + Exercise --*-- BW Included --*--*--*-- FULLY EDITABLE WITH KEY! 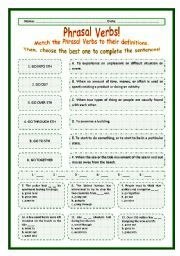 > Phrasal Verbs Practice 52! > --*-- Definitions + Exercise --*-- BW Included --*-- Fully Editable With Key! 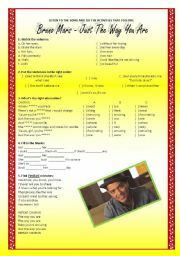 > Phrasal Verbs Practice 10! > --*-- Definitions + Exercise --*-- BW Included --*-- Fully Editable With Key! 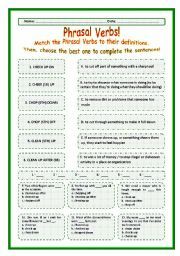 Simple exercise: students match the phrasal verbs to their definitions and then choose the best option to complete the sentences. The definitions and the sentences were taken from Cambridge Dictionary (online). Phrasal Verbs: CHECK UP ON *** CHEER (SB) UP *** CHOP (STH) DOWN *** CHOP (STH) OFF *** CLEAN (STH) UP *** CLEAN UP AFTER SB. > Asking Names! > --*-- First --*-- Middle --*-- Last --*-- Full names --*-- Fully Editable! Students learn how to ask names with celebreties (Brad Pitt, Hilary Duff) and movie characters (Harry Potter). Fully editable. I hope you have a lot of fun!! 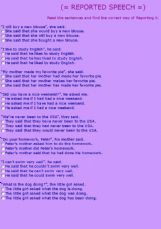 Students have to choosee the option that reports the sentence.